Boba Fett is not a viking. He's a bounty hunter. 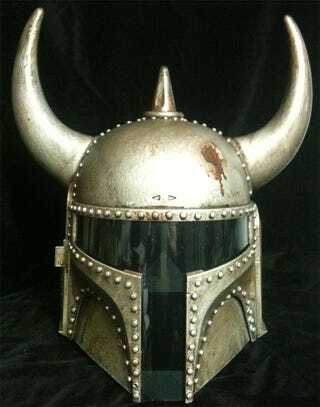 But if he were a viking, he'd not only wear something like this helmet, but also have a truly magnificent beard. Etsy seller Paul McCue created this wonder, called it "steampunk". I'll call it "awesome" and leave it there. McCue's site also has steampunk takes on Stormtroppers and Darth Vadar as well as Optimus Prime and Bumblebee.